Whip-style vaporizers utilize convection heating to vaporizer concentrates and dry herbs. Many whip-style desktop vaporizers have precise digital temperature control and LCD displays to ensure consistent vaporization for best performance. Whip vaporizers are similar to forced-air vaporizers in that warm air is drawn through herbs to vaporize the material. Whip-vaporizers differ in that the user inhales instead of using a built-in fan, although some forced-air vaporizers do provide a whip-draw option. 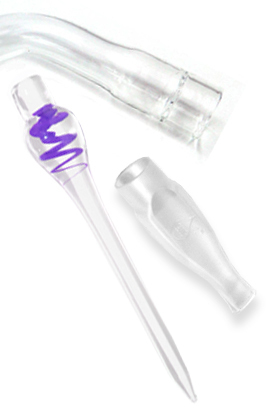 Whip vaporizers are named for the ground-glass whips, wands and mouthpieces connected to the vaporizer unit. The whip itself allows the vapor to cool before inhalation for a smoother experience. Whips can be customized and even paired with water filters and bong attachments to further filter and cool the vapor. Thanks to the explosion in popularity that vaporizing has enjoyed in recent years, choosing a high quality whip-style desktop vape is easier than ever before. With many high-performance units on the market, both affordable and high-end, finding the best desktop vaporizer for your needs is simple.